"First Time on the Market!" read the opening words from the real estate ad. The homes in this particular neighborhood were all of the 1960's vintage, and from the pictures on the website I could tell the home was in it's original state. I had to visit. The home appeared average from the curb. What was not average, however, was the love and care given to the home in 55 years of ownership.The first clue of superb care: pocket doors. In 1966, pocket doors were the rage. It was a simple way to block off rooms of the house so ruckus adults could cocktail in the front while precious children slept in the back. The doors also streamlined rooms and made bathroom quarters more private. I once lived in a vintage 1960's home (which had had several owners before me), and most the pocket doors had been removed and sheet rocked over. The one door that remained was sticky on its tracks and sometimes didn't like to move. I attributed the stickiness to the age of the door, never tired to fix it, and just lived with it. I was wrong. The house yesterday had numerous pocket doors and they all slid along their tracks as perfectly as the day they were installed. I marveled as I slid the first door back and forth. This simple example showed me that when something is well made and you take care of it, it will always take care of you. 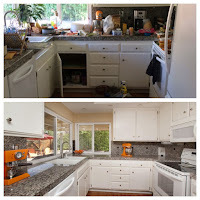 original cabinets had been painted in two tones to enhance their sleek styling. I recognized the stove from my childhood; a GE push button stove. It was not stained nor in any ill-repair, but again lovingly maintained so it could aid in nourishing the people who lived there. In my tour of Open Houses, I've seen many remodeled homes with the latest gadgetry and trends (i.e. kitchen islands and granite). This home reminded me that there is beauty in working to maintain what you have. In our society we are pushed to think having the newest item is the goal. The home I visited yesterday reminded me that maintaining and cherishing what one has should be the goal.